Most of you know I shaved the left side of my head last week. Generally speaking the response was great or maybe the people who hated it just choose to keep their opinions to themselves. Who knows? In the mist of the “It looks so great” praise there were a few “You’re so brave; I could never cut my hair” comments peppered in. This made me think, Why are girls so emotionally attached to their hair? Because the truth is I didn’t feel very brave at all. 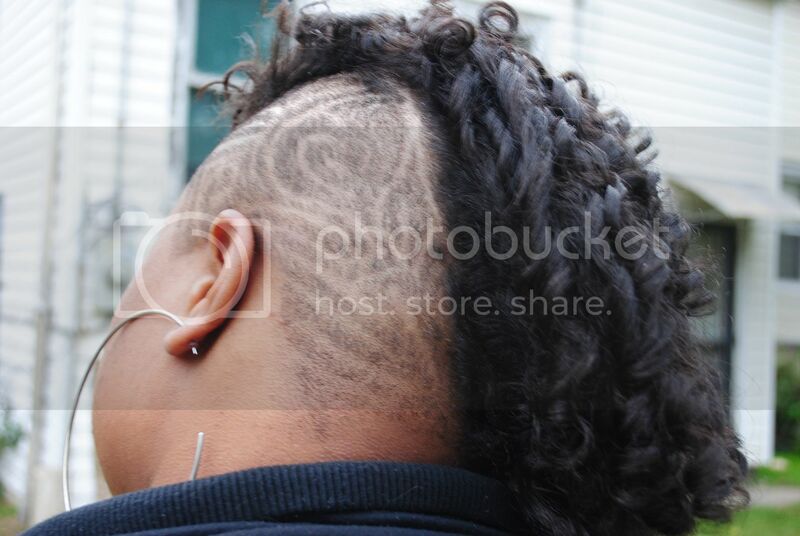 My stylist snipped the length off and cut it low, the next day I had a barber cut designs into it and well..that was it. I kind of wish I had a Make Over Episode of America’s Next Top Model type story to tell you about my hair cut. It would be much more interesting to read. You know the kind I mean. Like maybe I sat down in my stylist’s chair and before I could even form an opinion I was being told by my stylist what hair style worked best for my hair in relation to my face. I disagreed..she kept persisting. I cried a million tears while simultaneously embarrassing myself in front of the salons other inhabitants. She cut the length of the side off before I could protest. My heart rose to the middle of throat and kept beating there forming nervousness and eventually manifesting into a nervous break down. Although it didn’t happen that way I still can’t help but wonder again why girls are so attached to their hair? I can tell you that in the past no matter what hair style I had I always needed my hair around my face. I’ve worn everything from micro braids to weaves to my natural hair and no matter what the state of the hair I would never wear it in a ponytail or anything similar. I was convinced I had a large, fat face. My family weren’t helpful in this regard in fact they encouraged the theory. It was up to me to find the confidence to make changes to my hair. I just realized my face is fat and large! It will most likely look that way no matter what I do to my hair, so when I was 17 I cut my hair super short and dyed it a brownish blonde. Everyone at school kept asking me, “Are you ok?” They thought I had lost my mind. I hadn’t, but I did feel so much freer not hiding behind my thick hair. A year later I started getting weaves again, grew my hair out, wore it long for a while, and now I’m bald on one side. Guess I don’t have much to lose now! I asked the same hair question I’m asking here on twitter and many people spoke of pressure from society. I can’t say I’ve ever felt that. My Pocahontas dreams where completely internal and encouraged by my family, but I can’t say I felt like I needed to keep my hair long to conform to any sort of standard. My grandmother hates short hair, but she asked me to keep it long; she never pressured me. Now that part of my hair is short no one is acting weird about it; my family is just as ok with it as they were my long hair. So, can some one tell me where this pressure comes from? I mean Rihanna, Keri Hilson, Beth Ditto and Janet Jackson just to name a few have or have had short hair, so I don’t think it’s because of celebrities. Let me know in the comments why are you attached to your hair or alternatively why don’t you care? Oh what crazy hair styles have you tried?